Housed in the Chapter Library is one of the most unusual items held in the collections of St George’s Chapel. Brought back from Italy by Walter Harte, Canon of Windsor 1750-1754, it is a bound volume of the daily scrutiny papers for the Papal Conclave held at Rome in September 1676 [SGC LIB MS 16]. The Papal Conclave is a meeting of the College of Cardinals to elect the next Bishop of Rome, who goes on to become the Pope. The College is made up of Cardinal Bishops, Cardinals Priests and Cardinal Deacons. Each has a vote in a secret ballot, and in order to be elected, the nominee has to receive two-thirds of the votes. This is now the oldest ongoing method for choosing the leader of an institution. The Papal Conclave of 1676 was convened after the death of Pope Clement X and lasted from 4 September until 21 September of 1676, with votes being taken in the morning and evening. The college consisted of 67 members: 44 of them took part at the opening of the conclave, and the number rose to 63 when others finally arrived from abroad. The volume begins with an engraved plan by Gio. Antonio de Rossi of St Peter’s Square and the Papal Palace laid out for the Conclave, showing the cells occupied by each member of the Conclave. 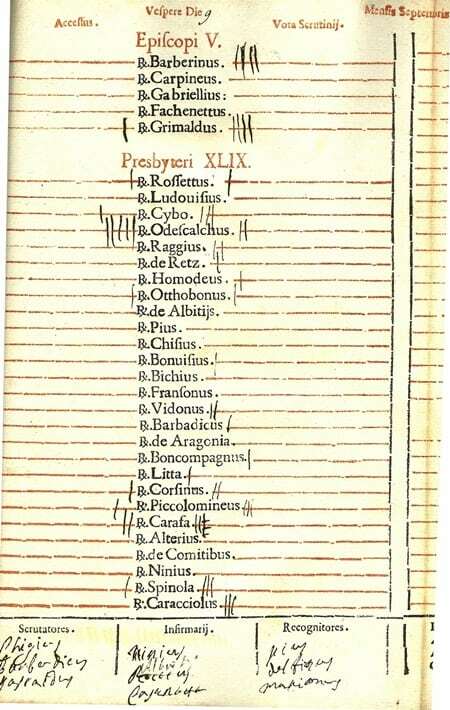 Printed lists of all the eligible cardinals were produced, and manuscript tallies kept of who received votes. Blank ballot forms bound at the back of the volume show how the votes could be cast secretly, while ensuring that the voter did not vote for himself. At the bottom of each list are written the names of the Cardinals elected to assist with the scrutiny, 3 as Scrutineers who would collect the votes, 3 as Infirmarii who would collect the votes of those unable to attend through ill-health, and the 3 Revisers who would confirm the vote count. At the end of each round of voting, the tallies would be added up, checked and double checked, and the individual ballot papers burnt. The colour of the smoke would signal the results to the people assembled in St Peter’s Square. Dark smoke signals that the ballot did not result in an election, while white smoke signals that a new Pope was chosen. Finally, on 21 September 1676, Cardinal Odescalchi was chosen Pope and took the title of Innocent XI. He continued as Pope until his death in 1689. He is remembered for his battles with the King of France over the supremacy of the church. The volume ends with an engraving of Odescalchi in his new role as Pope. It is a unique record of an important moment in the Roman Catholic Church. The Apostolic Constitution over the election of Popes requires all notes as well as ballot papers to be burnt in order to maintain secrecy. Documents such as this therefore no longer survive, making it an even more valuable source of information on the Papacy.